When I was first introduced to the ELM collection I was completely intrigued by how easy it was to work with. Nothing was necessarily ‘dressy’ or ‘casual’ — pieces could be mixed in a million ways – fabrics, colors, textures, patterns all worked off of each other enabling to wearer to, with a minimum of pieces, create an entire wardrobe. I felt as if I could close my eyes, pull a handful of pieces a hundred times over, and always come up with something unique, wearable and elegantly easy. Six years later, I’m still intrigued. Founded in Reykjavík, Iceland and currently based in Lima, Peru – both urban cities surrounded by unbroken, idyllic nature — it’s easy to understand how ELM and its creative director, Matthildur, so heavily influenced by her surroundings, can so easily manipulate the purest natural cottons and the most cutting-edge microfibers. 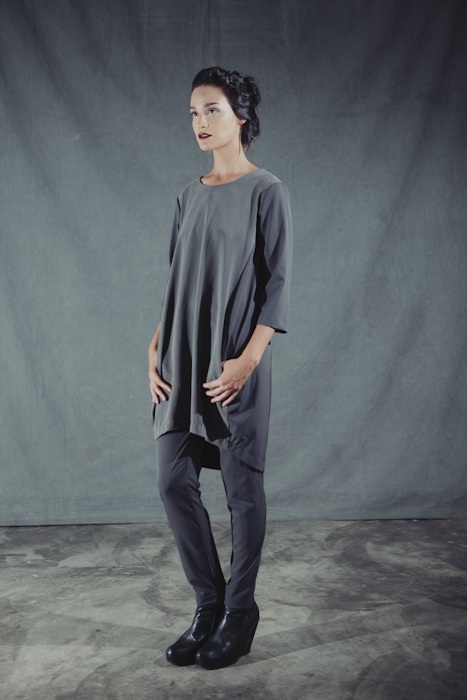 Logic and fashion are words rarely used together in the same sentence, but ELM’s collection is easily the most logically elegant approach to fashion I have ever worked with. Every season manages (in a way that leaves me scratching my head) to work with the same core of exceptional textiles – Japanese microfiber, Peruvian wool and Pima cotton, Spanish linen and silk, and stretch jerseys in wool, modal and cotton mixes – to make fresh, unique and wonderful pieces each season that are at once timeless and of the moment. These hallmark fabrics in every ELM collection allows for a systematic approach to dressing where you can, quite literally, pull a five-year-old piece from your closet and match it with a brand new arrival. Add to that the fact that many of their pieces can be adjusted or worn more than one way and you have a line of wardrobe staples that simply never feel stale. ELM’s intrepid garments are also a wanderer’s wish come true. Their microfibers and jerseys are weightless and pack like a dream. Their taffeta separates go from day to evening, are nearly impossible to wrinkle and can be hand-washed. It’s not at all unusual for a client to remark on the ‘new life’ her past-season ELM pieces receive with every season’s new arrivals. It’s no secret that I believe in dressing with intent and creativity, but there should always be a certain logic (yes, that word again) in what you purchase every season. In such a frenetic economy the idea of investing in something that will end up being ‘so last season’ in a few short months seems utterly frivolous, and that’s what makes ELM so fantastic. To me the collection embodies the spirit of a wizened, energetic traveler – these are pieces for a woman who thinks, works, reads, actually eats, and lives her life well and fully. I hope you can find time to stop in and view the new Autumn/Winter collection. In the meantime, take a moment to view ELM’s Autumn/Winter 2013-14 collection video by clicking here – it’s beautiful. Thanks for reading and all your support. For almost a year now I’ve had the pleasure of working with Tracey Chareas, owner of The Ruby Door and creator of most of the amazing jewelry in the store. She and I share a passion for stones, both precious and semi-precious. 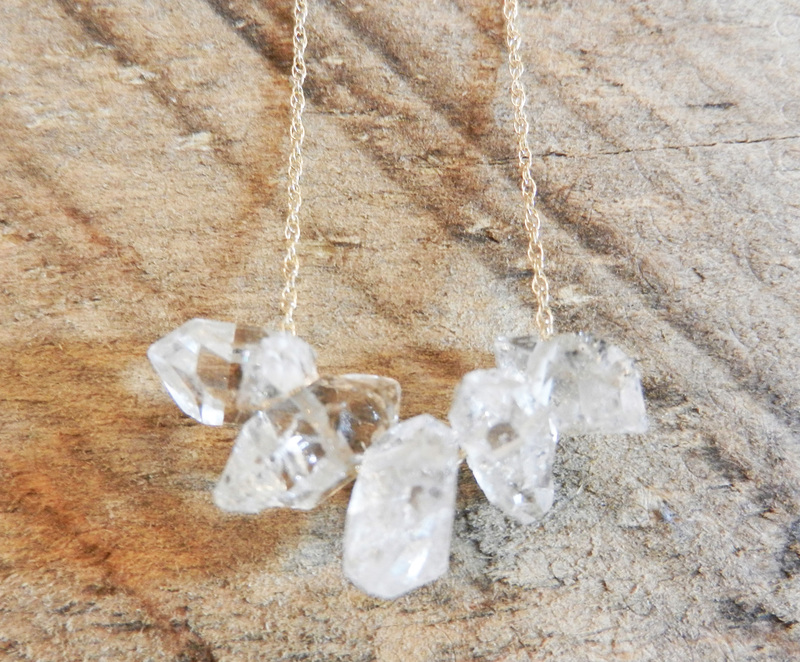 A recent series of pieces that Tracey has done focuses on what are known as Herkimer diamonds, and they are amazing. 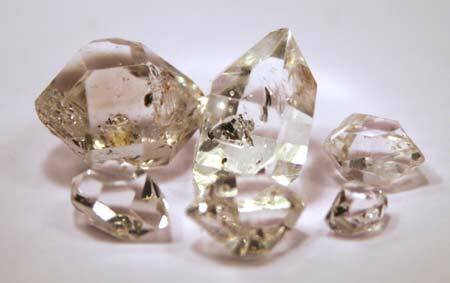 Herkimer diamonds are not, in the molecular sense, diamonds at all. They are a particular and rare type of crystal quartz that has points, or prisms, on both ends. The scientific term for a crystal’s prism point is its ‘termination’. While the overwhelming majority of quartz crystals have only a single termination, Herkimer crystals possess a double termination. In other words, both ends of the crystal finish in points, which allows for light to refract and reflect within the crystal far more brightly. Interestingly, it is still not known with certainty what causes this rare type of formation to occur. 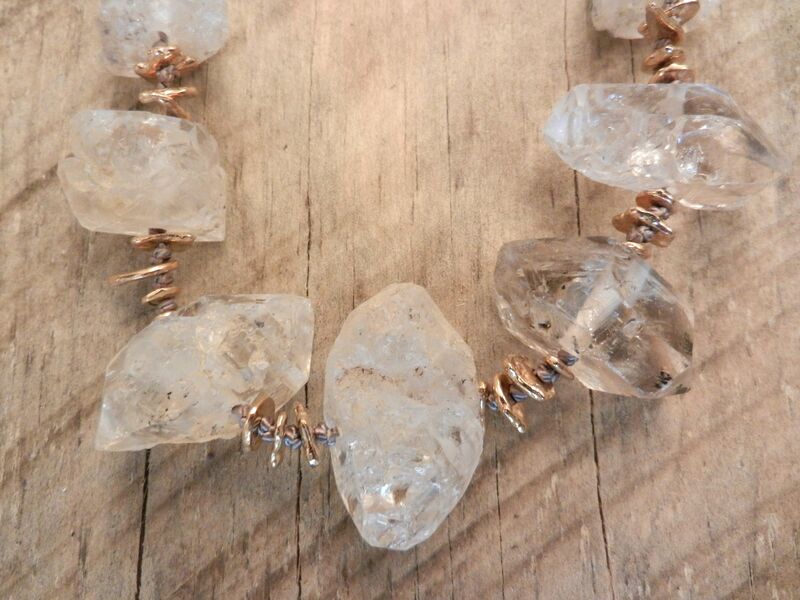 Quartz in general carries some very interesting properties, and it’s no coincidence that crystals have been used for centuries as a healing aid. When electrified, the molecular lattice structure of a common, single-terminated quartz crystal can actually transmit electricity – albeit only in one direction. 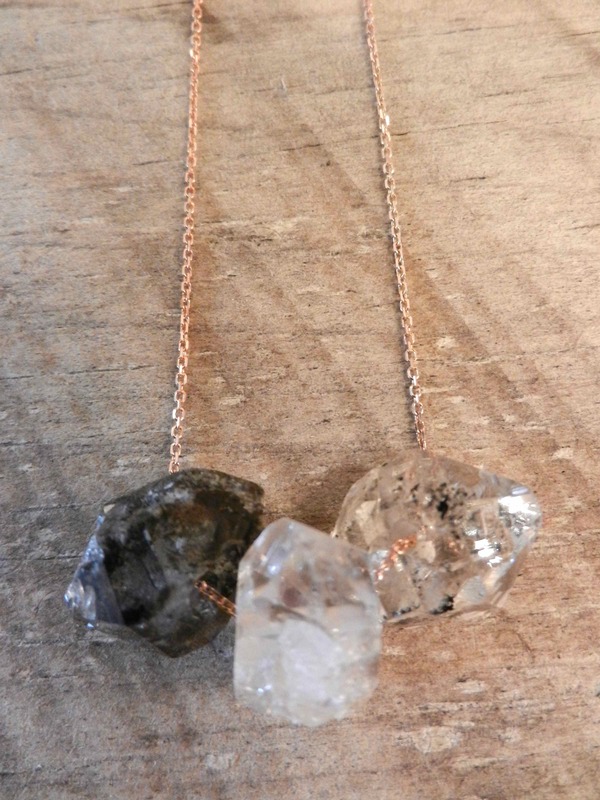 Those who are inclined to work with crystals for healing often use Herkimer quartz crystals because, unlike their more common single-prismed counterparts, the double termination of a Herkimer diamond can transmit energy both ways. Consequently they are often popular as jewelry not only for their shine and sparkle, but for their deeper energy-transmitting properties. Most Herkimer crystals are now mined in Australia and other countries, but they can still be found in the Herkimer region of New York State. Specimens from this region are highly prized and collectible for their extreme clarity and sparkle. Often accented by antique components or handcrafted metal work, when Tracey puts her hand to them the results range from minimal and organic to positively Byzantine. 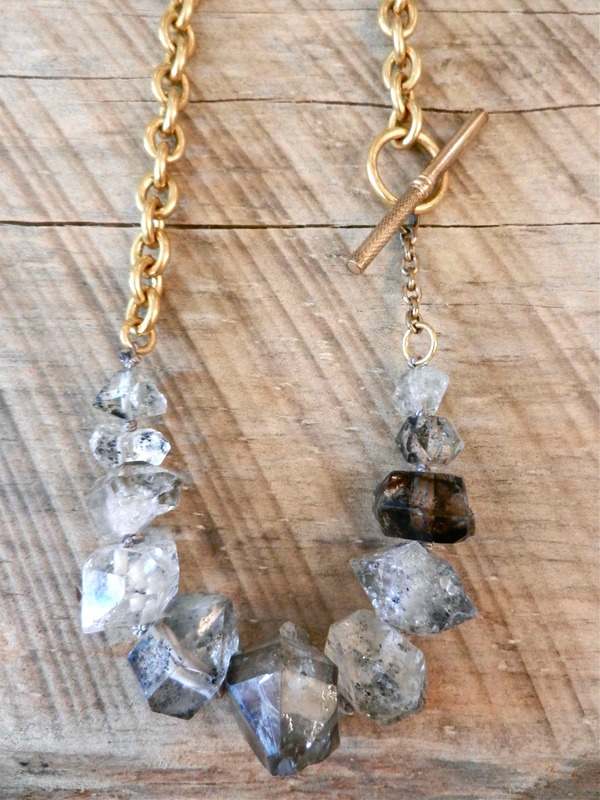 Matched with a vintage brass watch chain, these Herkimer diamonds at right range in size and color with a rich, multi-hued patina. 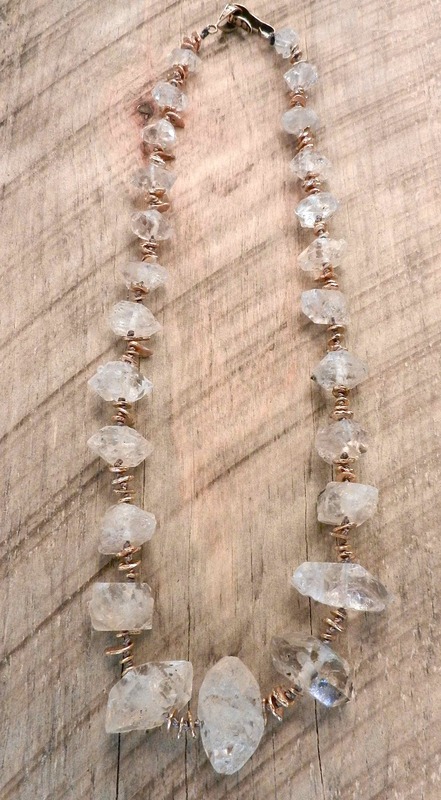 Below, an amazing necklace composed of gradated medium to very large frosty white and clear Herkimer diamonds with handmade brass chips. 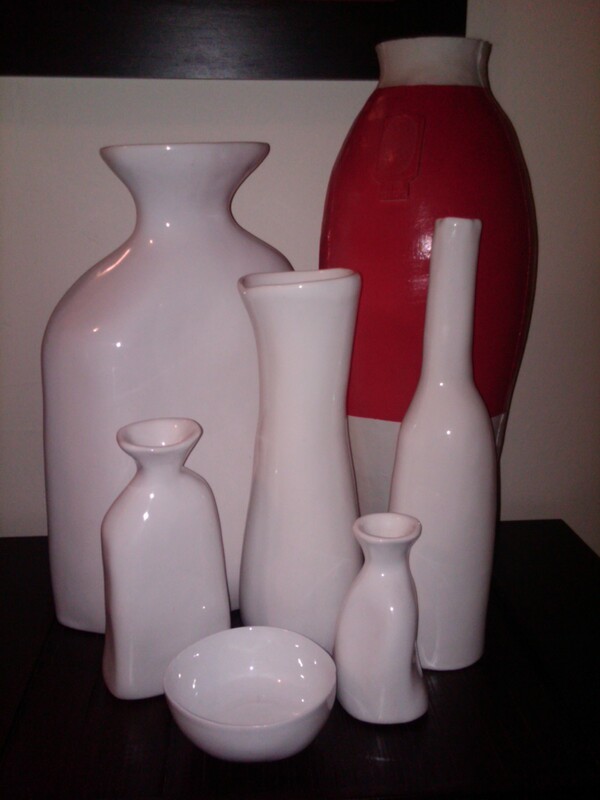 All pieces by Tracey Chareas are limited edition or one-of-a-kind. For more information, to inquire about a specific piece or a custom order, call 617.720.2001 or email tracey@therubydoor.com. The very first piece I sold in my store was a Manuelle Guibal jacket. It surprised me then – it doesn’t now. 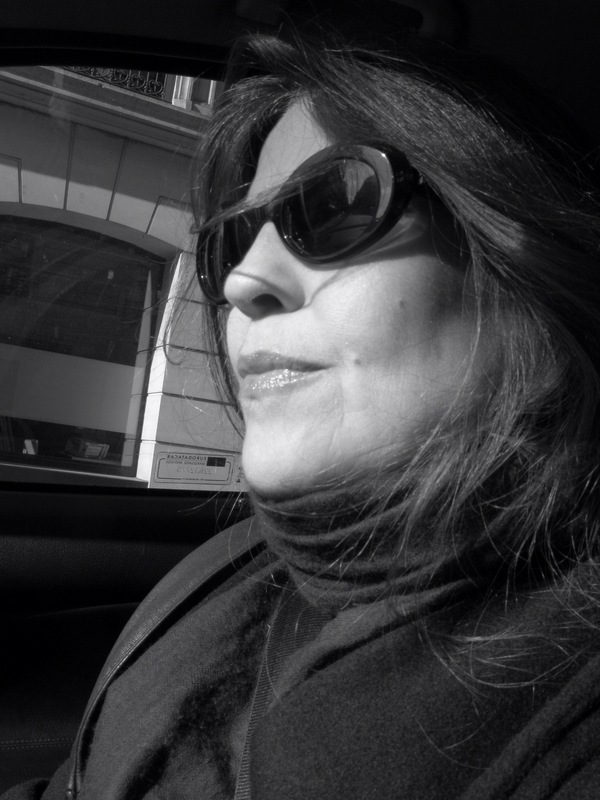 I first encountered the Manuelle Guibal collection on an unusually warm day in early March of last year. I was in New York scouting out my Fall buys and had already established who I was working with vendor-wise. I had some time to kill and decided to walk through the Chelsea Art Museum, which for the purposes of fashion week in NYC had been converted into stalls for various vendors to show their wares. As I turned a corner my eye was immediately drawn to this beautiful Japanese woman walking towards me, quietly conversing with her colleague. She wore a sleek black turtleneck that made the complexity and volume of the black skirt she was wearing that much more intriguing. It was a piece that was at once simple and complicated, wrapping over itself in a soft cocoon. She had black boots on and the only thing out of place was a strand or two of her long dark hair, and somehow even that seemed intentional. I loved the mix of tight and loose that she was wearing, but what intrigued me most about her was that, unlike most of the people surrounding her in this hot and crowded arena, she looked untroubled and approachable. To me she was the embodiment of what style is about – being comfortable not only in your own skin but in the clothing you choose to envelop it in. A few minutes later I entered an aisle and came upon a large booth, hung with garments in deep, rich hues and textures. At the center of the racks stood a simple dress form wearing almost exactly the same skirt as the lovely woman I had just passed. I approached it with tentative excitement. It was made in a black stretch wool gabardine that moved like water over my hand. I always buy with my fingers as much as I do with my eyes, so naturally I fell in love. I browsed the racks, taking a mental note of this item and that, all the while remembering that I really hadn’t planned to pick up another line. I took a card, nodded my thanks to one of the women there and continued to my next appointment. I could not keep the line out of my head for the rest of the day. The next morning I made a beeline back to the booth, and introduced myself to the line’s creator, Manuelle Guibal. Between my rather poor French and her far better English we managed to strike up a conversation. I learned very quickly the passion she had for her craft – her eyes danced as she told me of the time and difficulty she has with getting just the right tone and shape to each of her pieces, of the small factory in the French countryside that produces the majority of her knits and her close working relationship with them. It was obvious to me that, even though it was a great trouble to create what she did, she couldn’t imagine doing anything else, and in that I found a kindred spirit. Manuelle’s admirable work ethic manages to produce garments unlike anything I’ve ever come across. The Spring/Summer 2013 collection is done almost entirely in knit cotton, cotton poplin and crushed linen. Of course all wonderful garments start with equally wonderful textiles — but her focus on them, their properties and variations — this was something I rarely came upon. Each piece is individually garment dyed for a very unique depth of color and texture. Guibal’s washed and crushed linens are richly toned and imbued with a sense of age, as if you’re wearing a piece that was buried for millennia and just recently unearthed. They just slip on, softly skimming over the body, and the more wrinkled they get the better they look – and feel. Her cottons are unbelievable. This is not your typical ‘Hanes t-shirt’ cotton. This is serious cotton involving high-twist yarns carefully blended with just a touch of Lycra, hand-guided on a custom loom, then individually dyed with a rolled raw-edged hem. 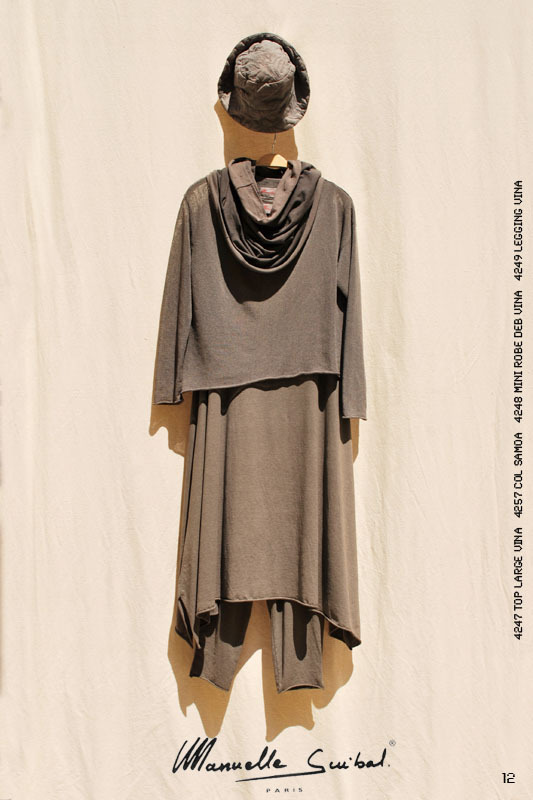 This is cotton knit to be soft as silk and light as air but made to wear like iron. Add to that crisp stretch poplin pieces that rustle like sailcloth, snapping taught and breaking free around you as you move. Insane. There’s a certain sense of peace that comes with wearing clothing like this. I don’t know if it’s because there is so much integrity behind each piece, that it’s created by someone who loves their métier, or craft, as Manuelle does. It’s cerebral style – there’s no other way to put it. These are pieces that you’ll have forever, investment pieces with no sense of season or trend. And it’s wonderful how systematic her pieces are – 5 pieces make 20 looks, and it’s all up to the wearer to be as classic or creative as they like, to mix them with other favorite garments and to, as always, dress with intent. I hope you all can visit soon and see the collection for itself — it’s a treat. Thanks for your following and support…. There is an elegance, a sense of nobility attributed to Japanese culture that I have always found fascinating. Japan is a unique synthesis of the old and the new – a country that, while at the forefront of technology continues a reverence for ancient tradition that pervades every aspect of society. 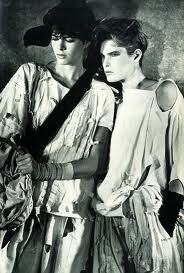 shredded edges and Yamamoto’s somber layers were initially dismissed as ‘bag lady chic’ by critics and editors alike. But they gained a rapid and loyal following with artists, architects and those working in creative fields, and were soon heralded as visionaries presenting a truly new approach to design. The world’s fascination with these designers lay in their unique approach to clothing – in an era that heralded conspicuous consumption and blatant displays of wealth, these three individuals were presenting garments that were the antithesis of ostentatious European high fashion. Soft, ragged layers, inky hues, intentional holes and exposed seams – these were not the clothes of a Wall Street kingpin or the ‘ladies who lunched’. These were garments for intellectuals and poets, artists and scholars. These were garments that challenged the wearer to think – a concept heretofore unheard of in the presentation of fashion. It was this shocking yet understated approach – lacking in overt sexuality and brazen showiness – that came to be the quintessence of Japanese fashion. Yet at the time, Japan and its people were still shrouded in mystery. 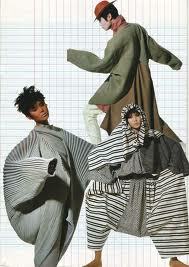 As the 1980s continued these designers and their unique vision began to infuse all aspects of design. The world turned its attention to what had been, since the end of World War II, an insular (and consequently fascinating) society – for many Japan had become the ‘undiscovered country’ where all things newly creative sprang. Only then were the unexpected parallels between Japan’s most cutting-edge creators and the millennia-old artistic ideals of Japanese culture revealed. There is a notion of modesty and subtlety, a respect for ceremony and procedure, an approach to duty and honor – that is unique to Japan. To the western eye these values are construed as anything from hopelessly anachronistic to downright obsessive – yet they contribute to a reverence for aesthetics that is utterly unique and exquisitely complex. This is an amalgam of two separate but similar concepts – wabi and sabi. Wabi speaks of truth to materials – respecting wood for being wood, allowing stone to be stone. Wabi sabi takes that same concept a step further. It is a deep respect for the effects of nature on these natural materials – rust as opposed to polish, patina instead of perfection – the raw edge, the weathered plank, the water-worn stone. Conceptually, it is the acceptance of the effects of age and time nobly demonstrating the impermanence of all things physical. Think of the coloring of an old copper roof or the weathering of the wood shingles on a seaside home – these are not things that can be made at will, they must instead simply happen with time. Hence our love of antiques – objects that have not only a visual sense of age but a ‘history’ behind them that lends an aura of comfort and intrigue. Wabi sabi also celebrates the subtle imperfections of those objects created by the human hand – the uneven glazing or intentional asymmetry so prevalent in Japanese pottery and ceramic work – a calculated reminder of time and nature. The Japanese lifestyle, particularly in highly populated urban areas, does not allow for a tremendous amount of living space. So, one must learn to live with less – the inherent love of simplicity, lack of clutter and appreciation of the simplest object that is the hallmark of most Japanese homes honestly has as much to do with simple lack of space as it does to minimalist Zen traditions. 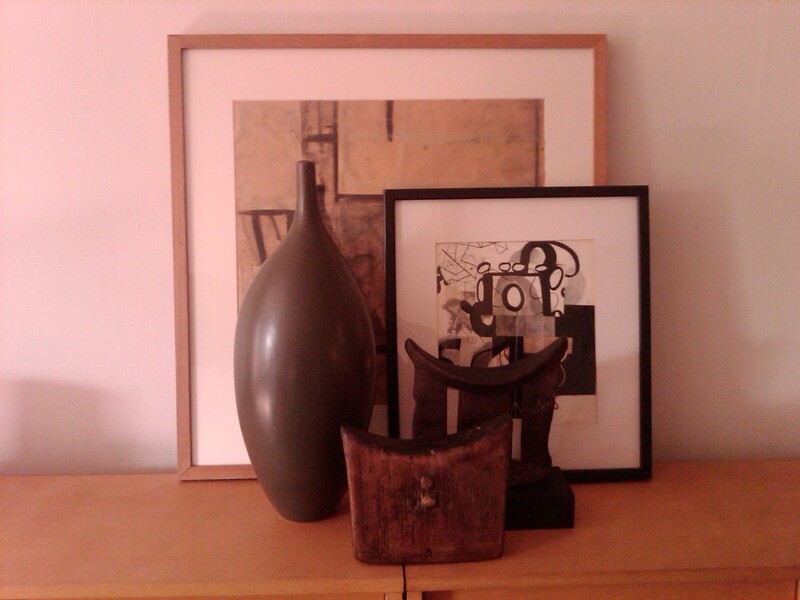 Consequently the things that one does choose to surround oneself with are chosen because they provoke thought, express an individual aesthetic and appeal to the soul – objects and items that have both function and meaning for the owner. When one can understand what motivates Japanese culture it’s less difficult to understand how a country that can turn out the finest high-performance computers can concurrently embrace the ancient subtleties of the tea ceremony – how a people whose attention to detail can produce the tiniest of complex microprocessors with the same finesse as it does the simplest stick of fine incense. One month after the astonishing events surrounding John Galliano and his dismissal as creative director at the House of Dior, the world has understandably moved on to far more urgent threats and catastrophes. Yet within the fashion industry, the Galliano debacle remains a mystery. Galliano’s publicly recorded pronouncements of his ‘love’ of Hitler and his disdain for Jews affected the fashion community in a way that rarely happens. We’re used to cattiness, drama and tantrums of diva-esque proportions – it’s an unfortunate side note of the industry. 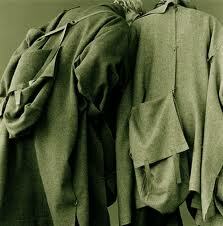 But Galliano’s actions ruffled feathers in a way that’s difficult to do in a business such as this. Much of it is because the fashion industry is known for being a ‘crazy quilt’ of personalities and preferences – a place where the only important religion is the unswerving devotion to the creative art of pattern and cloth, where rarity and uniqueness are feted rather than faulted. For anyone in this industry to persecute others because of their religious beliefs in this day and age is, frankly, unheard of. Personally, the entire Galliano disaster is as puzzling as it is upsetting. I cannot help but wonder what was really behind all of this — there is something that doesn’t quite make sense about an intelligent, learned and openly gay man professing affection for Adolf Hitler. I think not – so then why these damning actions? Self-hatred? Internalized homophobia? Or more? This is not a business for the weak-willed or the faint of heart. Clashing egos, creative differences, difficult personalities and the ever-present demands of banks and backers make it an industry unlike any other. As a designer constant reinvention is a necessity. This is an environment where one poorly reviewed collection can send your sales and reputation into a tailspin and potentially put your career on the line. The pressure placed upon you to balance creativity and profitability season after season is unbelievable – your backers expect revenue that will fill their pockets, your buyers expect wearable goods that will sell in stores while critics and editors expect sensational creations that will sell magazines. These multi-faceted demands to remain at the top are simply overwhelming. Although Galliano is no stranger to controversy or drama, and rumors of his struggles with drug and alcohol addiction have abounded for years his racist statements, made very publicly and on more than one occasion, seemed unusually out of character – even to those who know him and his histrionics. Was this then nothing more than a sad and desperate attempt, consciously or not, to divorce himself from the demands of producing not only for Dior’s ready-to-wear and couture collections but his own eponymous line? Whether the motive was public shock or personal sabotage, his behavior was inexcusable and has engendered no sympathy, even after a public statement of apology following his arrest for disorderly conduct. 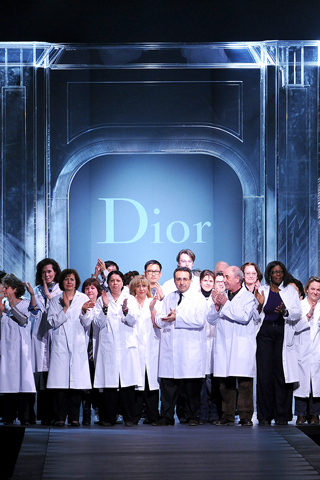 My sympathies lie instead with the employees of the House of Dior as well as the buyers who rely on the power of both the Dior and Galliano labels to ensure successful and profitable seasons. There has been tremendous speculation as to who will replace Galliano at Dior’s helm, and also whether his own ready-to-wear collection will remain in production. The showing of Galliano’s own collection a few days later was, unlike his usual runway extravaganza, without fanfare – and without its designer. After an unusually short runway presentation (26 looks as opposed to the usual 40 or 50) viewed by a fairly large audience (behaving on the same impulse that won’t let one look away from a horrific car accident) it was reported that, yes, the Galliano showroom would be open and, apparently, booking appointments. will refuse to patronize you? Several months from now, when the fall collections being to arrive, Galliano’s name will certainly still bear the stains of his actions. Any buyer with a semblance of reason would not wish to risk their bank account or their reputation for the sake of a handful of garments, however beautiful. As for Mr. Galliano, if his intentions were to absolve himself of the mantle of responsibility he held he could not have accomplished the task more thoroughly. It is a very sad thing when an individual capable of such genius so thoroughly and intentionally ostracizes himself from the fashion community – no company will hire him in the near future and even his most devout followers will be ill at ease wearing his designs. 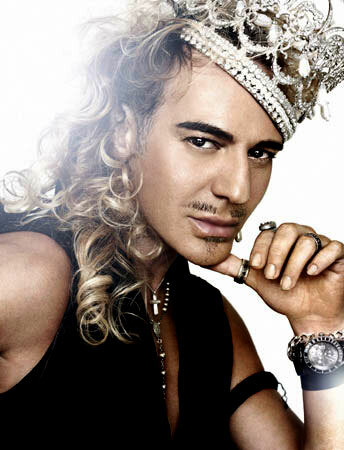 Food for thought, Mr. Galliano, as you dine on the ashes of a once-great career. Women on both sides of the Atlantic rushed to the causes of the war effort, many of them taking up the tasks and responsibilities traditionally held by men. 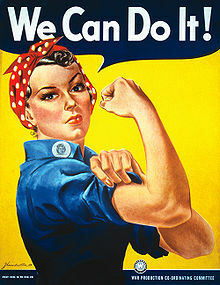 Rosie the Riveter convinced a generation of wives and mothers that “we can do it” – and do it they did. Clad in boilersuits and work trousers, overalls and head wraps, they led the war effort in factories and production lines. 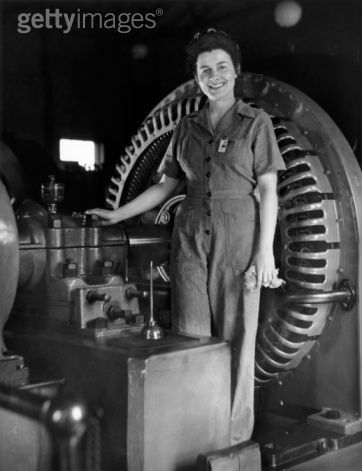 Fashion may have been on hold, but American women did not abandon their sense of style – as efficient as they were, these female factory workers never thought twice to keep up their appearances – wearing makeup, jewelry and attractive hairstyles. During this time pants began to slowly ebb outside the confines of the work arena. The end of the war ushered in a renewed devotion to fashion. 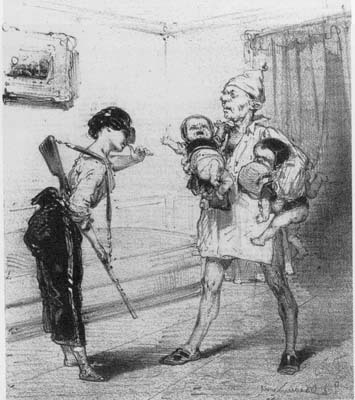 Women relinquished their places in the workforce and were relegated once again to the home, where their responsibilities as wife and mother took precedence. 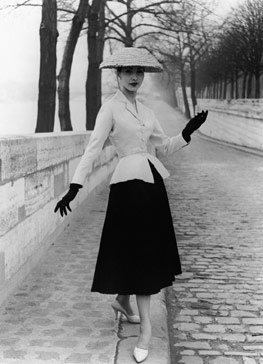 Gender roles returned with unprecedented vigor, and fashions followed suit – Christian Dior’s ‘New Look’ reintroduced volume and femininity to the masses, along with a curved shape that required a return to restrictive undergarments. Though criticized by some as setting fashion back, the New Look quickly became the most influential silhouette of the time. It was not until a decade later, when a young designer from Algeria, breaking away from his post at Christian Dior to design his own eponymous label, did trousers finally become part of the mainstream. It was during the 1960s – the space race capturing imaginations, the London Youthquake in full swing and the Vietnam War channeling a youth culture finding its voice for the first time – that Yves Saint Laurent presented his first couture collection. Saint Laurent was less a fashion anarchist than he was a visionary, capable of seamlessly merging forward-thinking fashion with his client’s desires. While many of his contemporaries challenged the public with looks that were new to the point of being avant-garde (Mary Quant’s miniskirted youth, Courreges’ all-white ‘Moon Girls’, Paco Rabanne’s garments-as-armor), YSL earned his mantle as a design genius among fashion’s cognoscenti with his devotion to the finest fabrics, the best tailoring techniques and an aesthetic that was as desirable as it was advanced. 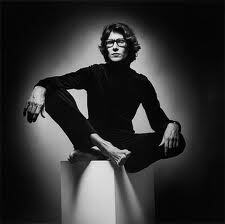 Saint Laurent included trousers with matching tunics in his couture presentations as early as 1963. In comparison to his more cutting-edge contemporaries, his tailored pants seemed positively sedate. 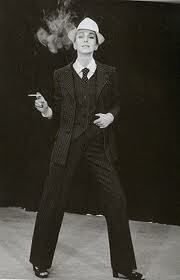 YSL’s tunic-and-pant pairings were followed by trouser suits over transparent blouses and finally, in 1968, his piece de resistance – ‘Le Smoking’ – a simple, impeccably fitted trouser suit with satin lapels, playing off of classic men’s evening attire. 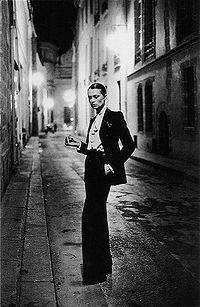 The unapologetic androgyny of ‘Le Smoking’ made it that much more sensual, inspiring a new attitude and sense of freedom heretofore unseen in haute couture. Today it’s difficult to comprehend women not wearing trousers as part of their everyday wardrobe — it’s something that is, as it should be, taken for granted. It’s both ironic and amusing to realize that, regardless of gender, every time you slip on a pair of pants you innocuously partake in a revolution. Pants are, more than any other garment, a powerful representation of struggle – struggle for power, freedom, autonomy, recognition. It’s unlikely at this point in the history of fashion — where so much has been done, so many boundaries challenged and so many claims made to the effect that nothing ‘new’ is left to create — that any other piece of clothing can ever again have the same impact on society. In a spring season where menswear-inspired trousers have become a focal point of the collections and women are unequivocally ‘wearing the pants’ again in fashion, it seems appropriate to examine the impact that the trouser has had throughout history. It seems strange to think that such a basic item of clothing can create so much turmoil — yet in 3,000-plus years of recorded human history, pants have only been considered acceptable public attire for women for the past 40. Never in the annals of fashion has a specific garment been the object of so much ridicule, debate and polarized opinion. 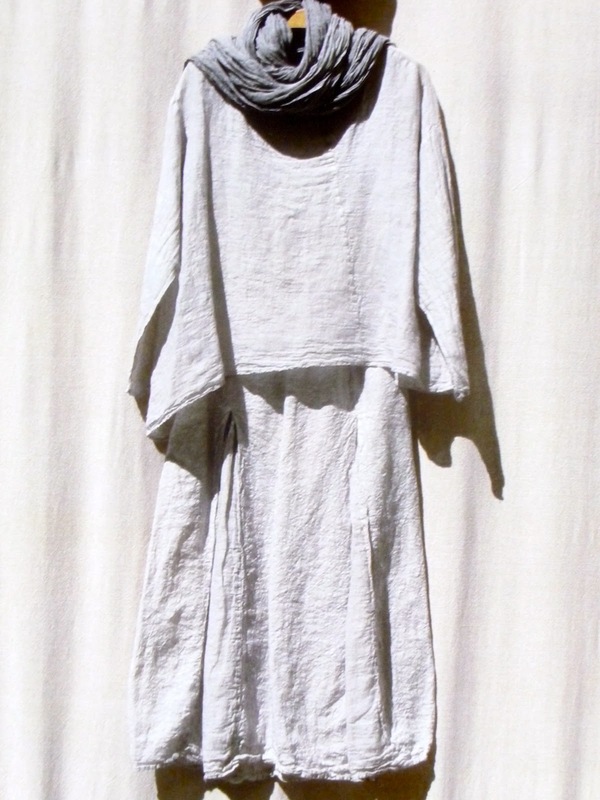 Originally the mode of dress for both sexes was based on a sarong-like skirt or toga-like gown. Over time, of course, cultures evolved and societies flourished. The advent of more refined textiles and complex tailoring techniques paralleled this evolution, and a decidedly class- and gender-based code of acceptable dress came about. 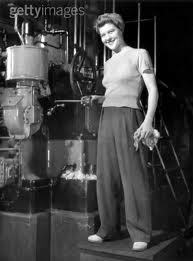 The first fledgling appearances of women in trousers began in Europe around 1800 to the great dismay of the male ruling class. 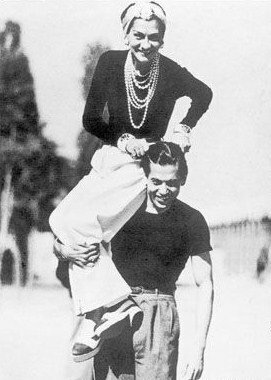 In the misogynistic society that pervaded Europe at that time it was felt that, if women were allowed the freedom of menswear, what other emancipations would be desired next? 1851 — Amelia Jenks Bloomer, a suffragette pioneer and author of the feminist journal The Lily, began crusading against the tyrannies of the corset with the ‘anti-crinolinist’ movement in the United States. She designed and wore a pair of long, full bouffant pants ( later called ‘Bloomers’ ) that were fitted at the waist and ankles. Not surprisingly, the subsequent scandal that ensued lent the garment little support. Many openly expressed that controversial apparel such as this should be reserved for those women – rebels, hygienists and feminists – who simply did not keep ‘acceptable’ company. 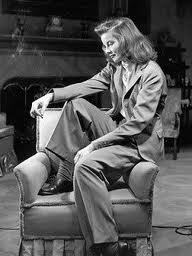 It was not until the early 1920s that women en masse began to view the viability of trousers. Vitality and activity, sports and resort travel became an integral part of any society woman’s life, and she must have the wardrobe to accompany it. Parisian couturiers, acceding to their client’s demands, began to create sport, resort and après-ski pant ensembles – enabling a new generation of women to participate in sports activities as never before. 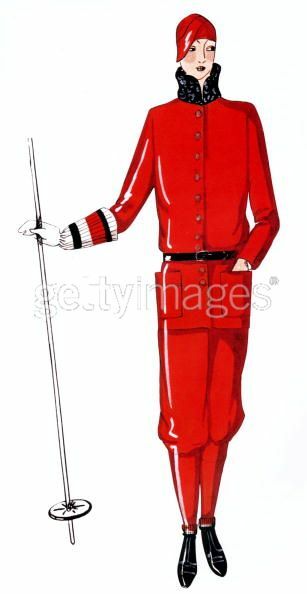 Though the trouser was still relegated to the shores or the slopes, these changes were not without impetus. The winning of the long-fought suffragette movement, the upheaval of World War I, and later the introduction of jazz and its accompanying passions afforded women an entirely new view of their position in society – with it came garment choices seen not just as a form of attraction, but a statement of solidarity. Corsets and complicated layers were, slowly but definitively, being relegated to the past. To spend the weekend in an easy resort ensemble and then be expected to return home to the complexities of the corset was no longer feasible. Women had had their ‘place’ in society, and their mode of dress had assisted them in this. It was time for change – complex layers, bindings and accouterments were replaced with softer fitting, less constricting designs. For so many women of this period the resort trouser represented both rebellion and emancipation – not only a release from the physical restraints of corsetry but from the broader, more ethereal constricts of morality that those garments represented. first to unashamedly don trousers while on holiday — not because they seemed stylish, but because they were comfortable . Her creations , along with those of contemporaries like Patou and Lanvin, ushered in a new era that trumped the bound and corseted shapes of the time to eventually become the de rigueur silhouette of the era.